The Biodiversity Heritage Library works to make biodiversity-related literature freely available to the world. They've got thousands of image libraries to peruse, but one of the richest is their collection of shark illustrations, with more than 370 pages. Here are a few of our favorites. We're not quite certain just what species some of these illustrations, like the one above dated to 1799, portray. But the level of detail and the coloration is just stunning. The bottom view of a male hammerhead, below, was published in 1787. This Black-mouthed dogfish comes from a volume called "A History of the Fishes of the British Islands," which was published in the early 1860s. These anatomical illustrations were published in 1909 in a German language paper called (roughly) "Studies on the muscles innervated by Trigeminal nerve of the Selachians (sharks and rays) to adjacent organs, taking into account their relationships." This illustration, of fisherman trying to land a sawfish, is from a French natural history volume published sometime in the late 1870s to early 1880s. 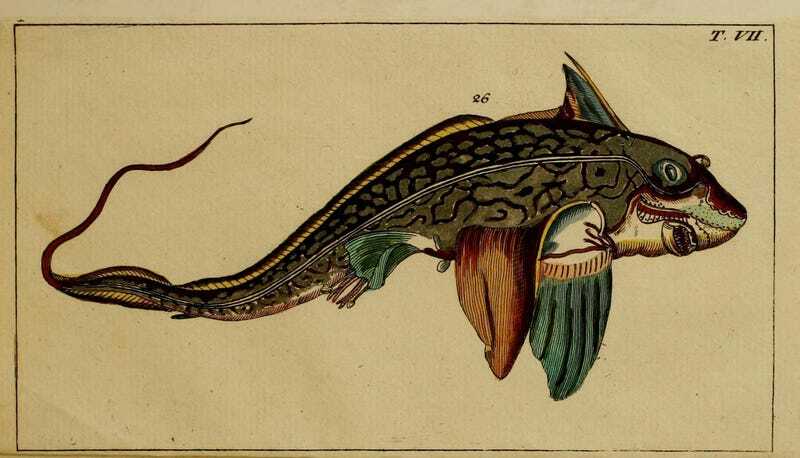 The caption for this drawing is simply "Gorgeous 1752 engraving of a shark with some serious teeth." This drawing of ray anatomy comes from an American book printed in 1913 called "The Plagiostomia: Sharks, skates, and rays." These sharks - a sawfish, a white shark, and a hammerhead - come from an 1889 book titled "Natural History of The Animal Kingdom For The Use of Young People." This beautifully-colored drawing features a whale shark, what we suspect is a blacktip reef shark, and some sort of ray. It's from a 1949 book called "Field Book of Giant Fishes." Finally, this simple drawing of a thresher shark with its characteristic catapult tail comes from the 1860s volume, "A History of the Fishes of the British Islands." Lose hours poring through the drawings, collected in more than 1700 albums, at the Biodiversity Heritage Library's Flickr account. All photos above are CC-BY-2.0 licensed.